It’s that time of year: the list of restaurants participating in Boston’s summer Restaurant Week has been released here. During Week 1: August 14-19 and Week 2: August 21-26 (generally no Fridays or Saturdays), the participating restaurants offer a 2-course lunch for $15.11, 3-course lunch for $20.11, and 3-course dinner for $33.11 and some may have additional deals. I’ve taken advantage of past Restaurant Weeks, but usually only manage to squeeze a couple places every time. Check out the extensive bar menu at the Sole Proprietor for $5 appetizers Monday through Friday from 4-6:30pm and get cheap, high-quality seafood. The menu includes a number of creative sushi rolls, as well as seafood classics like oysters and shrimp scampi. Although the dishes are supposedly appetizer-sized, they’re big enough for a meal (unless you have the appetite of a teenage boy – but order 2 apps and it will only set you back $10!). I had a vegetarian roll (avocado, cucumber, and asparagus) and my favorite roll, the tuna crunch (tuna, avocado, crunchy sweet potato sticks). Our meal for three came to just $25, or $30 with tax and tip. Not too shabby! Check out my most recent post at 3 Buck Bites, complete with corny joke and Red Chili from Tortilla Sam’s in Worcester, MA. I’m not sure I’ve ever mentioned Tortilla Sam’s here, but it’s a pretty decent, and cheap, Mexican joint in town. Not exactly authentic Mexican food, but their hefty burritos will satisfy any craving. They also have a lot of vegan options – including the only Spicy Tofu Wings in town, tofu burritos, and lots of grilled veggie/ bean combos. Look at that! Yes, that is calamari on top of a pizza. Here’s the whole thing – Fried Calamari pizza with a delightfully spicy tomato sauce, topped with arugula, fried calamari and a creamy lemon aioli sauce. Hard to eat without dropping half the calamari on your plate, but worth trying. This is the Roasted Pulled Chicken pizza – with gruyere cheese, caramelized onions, pesto, and scallions. Awesome. Not pictured: the Classico di Baffetti with basil oil, tomato sauce, and shaved parmesan grana – which I’m eating as I type. And getting greasy fingerprints on my keyboard. We ordered 3 pizzas to feed 5 girls. Little did we know, they are HUGE. After stuffing ourselves to the brim, each of us went home with at least 2 large slices of pie. The pizzas are a little pricey ($12-19) – but totally worth it, in quality and the sheer amount of food you get. As the sign states, ‘pizza pies’ are what you can expect to find at the Corner Grille – but these are not your average pizza pies. If you don’t live in or near Worcester, MA, you probably haven’t been to this unassuming little shop – even if you do live nearby, the Corner Grille is much more of a well-kept neighborhood secret than a pizza destination for most people. Well, friends, you are missing out. Corner Grille pizza is, by far, my favorite pizza ever. What’s so special about this pizza? Is it the creative toppings – from caesar salad to butternut squash to caramelized onions – or the uber-thin, burnt around the edges crust? I’m sure it’s something different for every Corner Grille aficionado – but for me, a good pizza is all about the crust. The thinner, the better. Theirs has a pleasantly crispy, slightly burnt edge that tastes of pizza oven cracklings – you really can’t get much better than that. Is it possible to fall in love with a sandwich? Because I have. One day, I stumbled upon Crema Cafe in Harvard Square. I was cold and in need of coffee, and I pushed my way through the hoardes of Harvard students to the counter, where I bought a croissant and a coffee. The coffee hit the spot, but I wouldn’t say it was especially memorable. The croissant was…a croissant. Flaky, buttery, but I’m not really a connoisseur of croissants. A few weeks later, I ended up at Crema Cafe again. This time, with friends in tow, we decided to have lunch. And then, it happened – I fell in love with a sandwich. The Crema Chicken Sandwich, to be exact – grilled chicken and avocado slathered with a “zesty” corn and cheese spread, on white bread, grilled/pressed. OH. MY. GOD. I cannot get enough of this sandwich. It has a “zesty” kick, with the melty cheese and creamy avocado, large chunks of chicken, and the crusty bread…it’s everything I could ever ask for in a sandwich. Since that fateful day, I have been to Crema Cafe literally every time I’m in Harvard Square. I also tried the Spinach Artichoke Chicken Sandwich – chicken and a creamy spinach/artichoke spread on a crusty focaccia, grilled. Delicious, but not quite as awesome as the other one. Their other sandwiches, soups, and the like look mighty tasty too. Ok, so the food is great. The atmosphere could use a little help. Well, it’s just that it’s always so crowded – with Harvard students (ick) and moms with babies (double ick). The lines are usually long, and the staff aren’t too friendly. Crowded can be a good thing, but not when I always have to hover for a table because some Harvardite is taking up an entire table for 4 with their laptop and books. Once the weather warms up, Crema will have room for outdoor seating – much preferable to cozying up with screaming babies and laptops. In short, I could eat that sandwich every day. But next time, I will probably take it to go. Psst…It’s Restaurant Week in Boston! 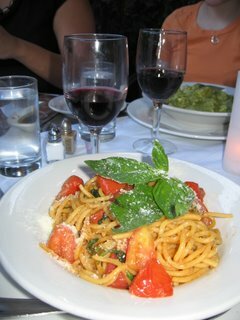 If you live in the Boston area, be sure to take advantage of Restaurant Week 2009. Why: Because the recession is going strong, and you haven’t been out to dinner in awhile. For the complete list of participating restaurants, visit bostonusa.com. I’m going to try to catch up on my blogging this week before I leave for vacation, but no guarantees. The internet has been iffy lately, grr. And I’ve got packing, shopping, and errands to do before Saturday! -Tried out the new Vietnamese restaurant on Green St. (where Coral Seafood used to be). In my professional opinion (ha! ), not as good as Dalat, but I’d been willing to give it another chance. The food was “eh” and the service wasn’t too great. Had takeout from Dalat last night, and it was delish as usual. -Ordered and recieved “Heat” by Bill Buford, but haven’t started it yet. At this point, I’m in the middle of at least 3 books. Starting a 4th will probably not help the situation. -This month’s Food & Wine issue is all about “eco-epicureanism.” I know, you’re like “Huh, whatever that is…” but it’s actually really cool stuff- thinking about where your food comes from, and striving for our health and the planet’s in the way we cook and eat and enjoy food. Keep up the good work, Dana Cowin! -“Vegan Diet Reverses Diabetes Symptoms, Study Finds” Having worked with diabetes patients all summer, I find it interesting whenever it comes up in the Health news. Researchers could be on to something here. From what little experience I have though, I can tell you that patients are not always willing to give up their eating habits, no matter how bad they may be. -Also about Diabetes, “Strength Training Can Help Heavy Teens Reduce the Risk of Diabetes.” Not just strength training, but any exercise is good. Ok, that’s all for now! If you’re in the Northeast, stay cool! Well, ok, we only went to NYC but it still involved alot of time on the road (including a 6 mile span of the Cross Bronx Expressway that took 2 HOURS to drive through, grrrrr1). We were in NYC for the day to see a taping of the Daily Show with Jon Stewart (awesome, by the way!) and then we went out for dinner afterwards. After driving down to the West Village, we parked and Celeste and I led the way to La Focaccia! We could have easily wandered around the Village and found something equally tasty, I’m sure, but our hearts and stomachs were set on Focaccia- our beloved, cozy Italian place. To make the evening even better, we scored a sweet table for four outside and enjoyed the best weather the Northeast has seen in weeks! Celeste, my favorite dining partner (and I, hers), discovered this little jem of a restuarant last Spring-ish and it has been a favorite of mine ever since she took me there. Which is saying alot, since I’m not usually a huge fan of Italian (not really a pasta person). 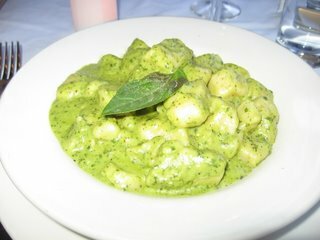 But their Gnocchi is to die for, and I always get it with Pesto, quite possibly my favorite thing ever. Creamy and delicious as always, delicate and garlicy and filling. 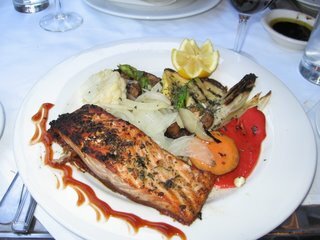 Mom had Grilled Herb-Crusted Salmon, since she is not a pasta person either. A’s Spaghetti with Tomato Sauce. BUT we had to save room for Magnolia Cupcakes! Conveniently located just around the corner from La Focaccia, we sprinted over before trekking back to the car. I had missed out on Magnolia last time I was in the city, so it was absolutely a must this time around. I’m not gonna lie, I bought 2 cupcakes for myself. Ate 1 in the car, and the other when we got home. And man, it was totally worth the sugar tummyache- I think I would drive to NYC just for those cupcakes. Ok, maybe not…but they are addictive and delicious. Of course, as luck would have it, I dropped the box when I got home. Frosting side down. Squished, but still good!